pH is short for the Latin phrase pondus Hydrogenii or the 'weight of Hydrogen'. Commonly said to be a measurement of how much acidic or alkaline water is. pH is the measurement of the weight or amount of hydrogen (H+) and hydroxyl (HO¯) ions dissolved in water. It is the balance between the weight of these two types of ions which determine its pH value. In pure or distilled water these ions are in balance. H ions in a litre of pure water will weight 10-7 grams or 0.0000001 grams. So this figure is used to express the pH value. However for ease of use it has been the convention of the chemistry profession not to write the whole number and to ignore the negative value and just write '7'. In the natural world, pure water falling from the sky as rain water very quickly absorbs dust and other particles from the environment and so this unbalances the ratio of the two ions. The balance can either increase or reduced the ratio of Hydrogen to Hydroxyl. This unbalance is a very important chemistry measurement and is expressed in two terms. Any time there is more HO ions present than H ions then the water is said to be alkaline. For example, should the amount of H ions be reduced to say 10-8 grams, then the pH value is said to be 8. Any time there is more H ions present than HO ions then the water is said to be acidic. For example should the amount of H ions be increased to say 10-6 grams in a litre of water, then the pH value is said to be 6. The pH of water is given a logarithmic scale from 1 to 14. A pH of 7 makes the water neutral. That is, it has either no ions in it or an equal amount of both types. Pure water (distilled or de-ionised) has no ions in it so it is considered neutral. Water across the world varies enormously in its pH and aquatic animals adapt to live in water with its own pH. Most animals can adapt to different pH water if given enough time. But if exposed to a pH difference of, say, greater than 0.4 within a few hours, may suffer pH Shock and if severe can die. The rate at which animals can tolerate a pH shift varies greatly between species. But it is generally regarded that a rise of pH 0.4 or less within 2 hours is a safe rate for most animals. Most aquatic animals need to be kept within their natural pH water in order to breed successfully. One such popular tropical fish is the Neon Tetra. In the wild this fish lives in Amazon water with a low pH of about 5. But due to extensive captive breeding the animal has adapted to live in tap water with a pH around 7.2-8. However animals keep their natural evolved internal body cells pH value regardless of the outside. So when the Neon tetra tries to breed it can't do so in water with a pH above 7. As soon as the eggs or sperm are released from the fish, the osmotic pressure between the high pH tank water and the water inside the cells of the sperm or eggs is too great and the eggs and sperm literally rupture and die. So breeders place this fish in low pH water in order to breed them. A typical pH for a freshwater aquarium is 6.5 to 8.0 depending on the tap water used. The pH of a marine aquarium is typically 7.9 to 8.5.
pH is easy and cheap to measure with a test kit. 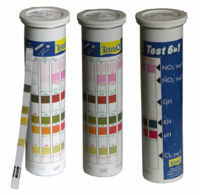 There are lots of different brand water test kits to be found in aquarium shops. Generally liquid test kits are more accurate than test strips ones. For the serious aquarium owner there are electronic pH meters which give a constant accurate display on a meter. Beginners need to know the pH value of their tap water as this will determine the type of fish they can most easily raise (it is easier to match fish to local water than to adjust the tap water to match the fish). A telephone call to their local water supplier can supply this information or by asking their local fish shop. As your aquarium runs, the nitrifying bacteria in it produce hydrogen ions which slowly pull the water towards the acidic (depending on levels of KH) and consume carbonate, therefore lowering KH. If you also have bogwood or plants in the tank, these decay and produce humic acid which also slowly pulls it towards the acid. This is why you need to either do regular water changes with fresh water that has higher levels of KH than in your tank or add a substitute like bicarbonate of soda or add a substrate that naturally leaks out KH like coral sand or soil. Old Tank Syndrome is often the name given to mature tanks that do not get their KH or pH levels monitored and perhaps do not get regular water changes and so eventually get to the point where the KH is used up and the pH crashes low leading to pH shock, the low pH causes the nitrifying bacteria to stop growing and and then high levels of free ammonia may accumulate. Tilapia are able to withstand long-term exposure to low environmental pH, judged by their energy status, ionic balance and plasma cortisol," by van Ginneken, van Eersel, Balm, Nieveen, Thillart, Journal of Fish Biology (1997) 51:795-806. This page was last edited on 27 March 2018, at 08:20.